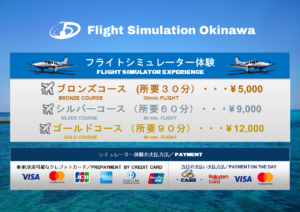 Our flight simulator experience program “Flight Simulation Okinawa” has started operating online payment system. With online payments, you can choose more credit card brands such as JCB, American Express, Diners and Union Pay!! Let’s enjoy the simulator experience with a convenient online payment.